Hoang V. Le graduated from the University of California, Berkeley with a B.S. degree in chemistry in 2008. While at Berkeley, Hoang worked in the laboratory of Professor Kenneth Raymond, studying supramolecular chemistry, synthesizing dicationic linkers, and investigating their stability in supramolecular systems. In 2013, he graduated from Cornell University with a Ph.D. degree in organic chemistry under the guidance of Professor Bruce Ganem. His graduate work expanded the scope of multicomponent reaction (MCR) chemistry by improving known synthetically useful MCRs and developing new MCRs. Hoang then held a postdoctoral position in the laboratory of Professor Richard Silverman at Northwestern University. 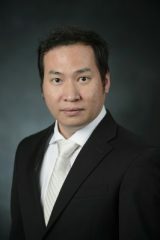 His postdoctoral research contributed to the development of two patented potential drug candidates for the treatment of epilepsy and drug addiction. His postdoctoral research also contributed to the discovery of many inactivators of Toxoplasma gondii ornithine aminotransferase for the treatment of toxoplasmosis. In July 2016, he started his independent research career as an Assistant Professor of Medicinal Chemistry in the Department of BioMolecular Sciences at the University of Mississippi School of Pharmacy. 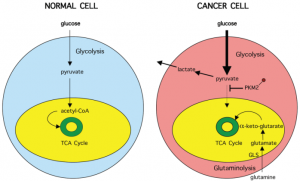 Metabolism in normal cells vs. one in cancer cells. The figure was originally published by Erickson and Cerione. Cancer cells have a very different metabolism from that of normal cells from which they are derived. Glycolysis, although enhanced in cancer cells, is no longer a source of biosynthetic precursors. Instead, glutaminolysis fuels the TCA cycle with glutamine-derived α-ketoglutarate. The enhanced production of α-ketoglutarate is critical to cancer cells as it provides carbons and nitrogens for the TCA cycle to produce glutathione, fatty acids, nucleotides, hexosamines, nucleotides, and many nonessential amino acids. 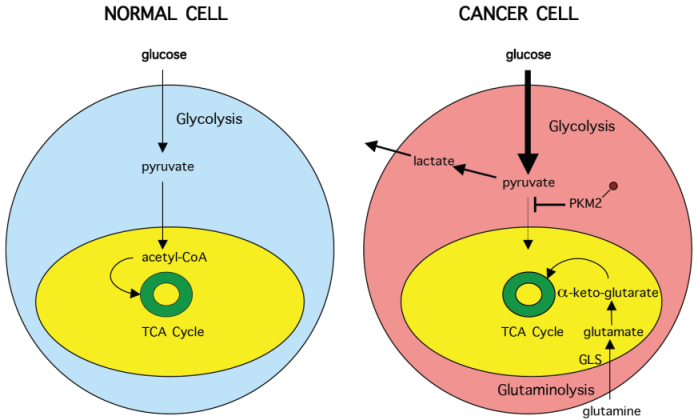 Glutaminase and isocitrate dehydrogenase are two critical enzymes in the production of α-ketoglutarate in cancer cells. A lot of times, when one metabolic pathway in cancer cells is blocked, they shift to enhance alternative metabolic pathways to maintain the production of essential molecules. Development of inhibitors for both critical enzymes in the α-ketoglutarate production allows us to study the effects on cancer cells when one of the enzymes is inhibited, as well as when both of the enzymes are inhibited. The κ-opioid receptor (KOR) is one of four related receptors that bind opioid-like compounds in the brain and are responsible for mediating the effects of these compounds. KOR agonists have provided therapeutic potential in the treatment of pain and convulsion, and as antidotes for opioid overdose, while KOR antagonists have proven useful in drug abuse relapse, depression, and anxiety. However, the development of current KOR ligands as therapeutic agents has been hindered by their unfavorable side effects. Current KOR agonists produce dysphoria, sedation, and depression due to their low functional selectivity, while current KOR antagonists possess unusually long pharmacokinetic profiles due to their long-acting effect. We are currently aiming to solve these problems for KOR agonists and antagonists. Atovaquone, the only current FDA-approved inhibitor of Plasmodium falciparum cytochrome bc1 complex. Cytochrome bc1 complex is a dimeric multisubunit electron transport protein in the inner-mitochondrial membrane and is a proven drug target in the prevention and treatment of malaria. Cytochrome bc1 complex is essential for Plasmodium falciparum as it maintains a pool of ubiquinone for the enzyme dihydroorotate dehydrogenase, which catalyzes the ubiquinone-mediated oxidation of dihydroorotate to orotate, in the pyrimidine biosynthesis pathway. The pyrimidine biosynthesis pathway is critical for the survival of P. falciparumbecause it cannot salvage pyrimidines and therefore is completely dependent on de novo pyrimidine synthesis. Inhibition of either cytochrome bc1 complex or dihydroorotate dehydrogenase has been shown to result in death of the parasite. We are currently focusing on the development of atovaquone-based and quinolone-based inhibitors of cytochrome bc1 complex. 11) Mascarenhas, R.; Le, H. V.; Clevenger, K. D.; Lehrer, H. J.; Ringe, D.; Kelleher, N. L.; Silverman, R. B.; Liu, D. “Selective Targeting by a Mechanism-Based Inactivator against PLP-Dependent Enzymes: Mechanisms of Inactivation and Alternative Turnover.” Biochemistry 2017, 56, 4951-4961. 10) Wu, R.; Sanishvili, R.; Belitsky, B. R.; Juncosa, J. I.; Le, H. V; Lehrer, H. J. S.; Farley, M.; Silverman, R. B.; Petsko, G. A.; Ringe, D.; Liu, D. “PLP and GABA Trigger GabR-Mediated Transcription Regulation in Bacillus Subtilis via External Aldimine Formation.” Proc. Natl. Acad. Sci. U. S. A. 2017, 114, 3891-3896. 9) Lee, H.;# Le, H. V.;# Wu, R.; Doud, E.; Sanishvili, R.; Kellie, J. F., Compton, P. D.; Pachaiyappan, B., Liu, D.; Kelleher, N.; Silverman, R. B. “Mechanism of Inactivation of GABA Aminotransferase by (E)- and (Z)-(1S,3S)-3-Amino-4-fluoromethylenyl-1-cyclopentanoic Acid.” ACS Chem. Biol. 2015, 10, 2087–2098. #Co-first authors, featured in “Introducing Our Authors” in the same issue. 8) Le, H. V.; Hawker, D. D.; Wu, R.; Doud, E.; Sanishvili, R.; Liu, D.; M.; Kelleher, N.; Silverman, R. B. “Design and Mechanism of Tetrahydrothiophene-based GABA-Aminotransferase Inactivators.” J. Am. Chem. Soc. 2015, 137, 4525−4533. 7) Zigmond, E; Ya’acov, A. B.; Lee, H.; Lichtenstein, Y.; Shalev, Z.; Smith, Y.; Zolotarov, L.; Ziv, E.; Kalman, R.; Le, H. V.; Lu, H.; Silverman, R. B.; Ilan, Y. “Suppression of Hepatocellular Carcinoma by Inhibition of Overexpressed Ornithine Aminotransferase.” ACS Med. Chem. Lett. 2015, 6, 840–844. 6) Le, H. V.; Ganem, B. “Mild Oxidation of Tosylmethylisocyanide to Tosylmethylisocyanate: Utility in Synthetic and Medicinal Chemistry.” Tetrahedron Lett. 2014, 55, 2003-2005. 5) Le, H. V.; Ganem, B. “A Practical Synthesis of Isocyanates from Isonitriles: Ethyl 2-Isocyanatoacetate.” Org. Synth. 2012, 89, 404-408. 4) Gober, C. M.; Le, H. V.; Ganem, B. “A Simple, General Synthesis of Carbonimidic Dichlorides.” Tetrahedron Lett. 2012, 53, 4536-4537. 3) Le, H. V.; Ganem, B. “Trifluoroacetic Anhydride-Catalyzed Oxidation of Isonitriles by DMSO: A Rapid, Convenient Synthesis of Isocyanates.” Org. Lett. 2011, 13, 2584-2585. 2) Sanguineti, G.; Le, H. V.; Ganem, B. “Studies on the Synthesis of Amidoximes from Nitroalkanes.” Tetrahedron2011, 67, 10208-10211. Invited paper in a special issue in honor of Professor Gilbert Stork on the occasion of his 90th birthday. 1) ­Le, H. V.; Fan, L.; Ganem, B. “A Practical and Inexpensive ‘Convertible’ Isonitrile for Use in Multicomponent Reactions.” Tetrahedron Lett. 2011, 52, 2209-2211. Invited paper in a special issue in honor of Professor Harry Wasserman on the occasion of his 90th birthday. 3) Silverman, R. B.; Le, H. V.; Hawker, D. D.; McLeod, R. L. “Inactivators of Toxoplasma Gondii Ornithine Aminotransferase for Treating Toxoplasmosis and Malaria.” U.S. Provisional Patent Application No. 62/406,104, filed on October 10, 2016. 2) Silverman, R. B.; Takaya, K.; Le, H. V.; Juncosa, J. I. “(S)-3-Amino-4-(difluoromethylenyl)cyclopent-1-ene-1-carboxylic acid, and Related Compounds as GABA Aminotransferase Inactivators for the Treatment of Epilepsy, Addiction and Hepatocellular Carcinoma​.” United States Patent US 2017/0101364 A1, published on April 13, 2017. WIPO Patent WO 2017/062942 A2, published on April 13, 2017.